Avoid the dirt and additional effort required of shore dives! Meet Giant Stride at the dock to load and unload your equipment. 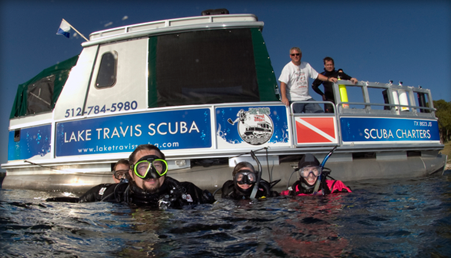 Lake Travis Scuba is a member of SeaTow boat emergency service. 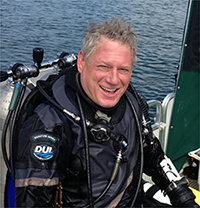 Robert Weiss established Lake Travis Scuba in November 2007. He has been a certified diver since 1988, achieved technical diving certification with training through PADI Tec 50, and is a seasoned PADI MSDT/Instructor for a wide range of specialities including Boat Diver, Enriched Air, Underwater Navigation, search and recovery and more. Robert is a certified American Heart Association CPR Instructor, PADI Emergency First Responder instructor, and a Diver Alert Network member. When not running charters and teaching scuba, he is a swim instructor at Nitro Swim, volunteers with Ride On Center For Kids (ROCK) and Spring Lake/The Meadows Center for Water and The Environment.